Green Man Festival, Thu 20 – Sun 23 Aug – Just confirmed as an In-House Therapist! Thursday 20 – Sunday 23 August 2015, Brecon Beacons, Wales. I have just been confirmed as an In-House Massage Therapist with Wild Wellbeing in the Nature Nuture Healing Area at the Green Man Festival. Leap, walk or crawl into the new Wild Wellbeing’s space at this year’s Green Man and discover our rejuvenating program featuring a vast selection of yoga classes, treatments and facilities all focused on your inner wellbeing. Nestled just beyond the gentle gaze of the Green Man in a secluded glade of ancient Welsh oak trees, Nature Nurture is the perfect place to mellow out, stretch and release those last drops of stress. Revamped for 2015, the Nature & Nurture healing garden is open from 7am to 11.30pm every day offering dedicated treatments – from qualified therapists, exercise classes (including yoga and Pilates) to simple, carefree indulgences such as a glass of wine in one of our glorious hot tubs. The family-oriented yoga program runs from 8am until 8pm, for those seeking invigoration or to wind-down. There is something for everyone; acro-yoga, beginners yoga, family classes, kids sessions, pregnancy yoga, hot power yoga and restorative yoga. Enjoy the luxury of pre-booked ‘Nurturing Relaxation Massage’, by a highly qualified therapist using natural massage oils or indulge in a treatment from the ‘Alternative Pitch Therapies’ – all of which can be pre-booked here. Full 2015 line up information can be found here. https://juliebladon.com/wp-content/uploads/2015/04/sanctuary-41.1000x664-green-man-930-x-494.jpg 494 930 Julie Bladon https://juliebladon.com/wp-content/uploads/2016/08/logo_min-green-300x69.png Julie Bladon2015-04-13 13:59:522016-09-04 02:47:03Green Man Festival, Thu 20 - Sun 23 Aug - Just confirmed as an In-House Therapist! 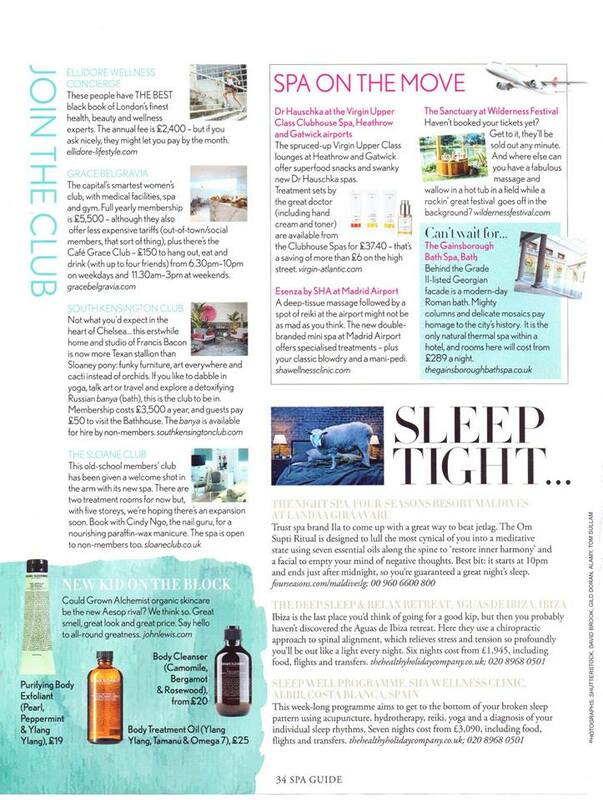 The Sanctuary (curated by Wild WellBeing) at Wilderness Festival gets a mention in the Tatler Spa Guide 2015. I’m really proud to be part of this great team of therapists and yogis. Roll on summer! This course offers the opportunity to understand the importance of fascia which is an amazing 3D web of connectivity that surrounds and interpenetrates all of our various “parts”. An understanding of fascia is now essential to all yogis, bodywork and movement therapists. A workshop where you will begin to understand the importance of fascia and also be introduced to Myofacsial Release techniques (MFR). Wilderness Festival 2015 ~ Line up to be announced soon! Wilderness Festival is always a highlight in my calendar. I’m a regular member of the Wild Wellbeing In-house Therapist Team. Roll on summer! See you in the Wilderness…. https://juliebladon.com/wp-content/uploads/2015/02/wilderness-fest-2015-banner.jpg 315 851 Julie Bladon https://juliebladon.com/wp-content/uploads/2016/08/logo_min-green-300x69.png Julie Bladon2015-02-04 16:20:512016-09-04 02:47:41Wilderness Festival 2015 ~ Line up to be announced soon! Stuck for gift ideas? You can now purchase gift vouchers and packages via my online shop. Gift vouchers are redeemable on Lomi Lomi massage, yoga workshops, weekly yoga classes, wellness packages and yoga retreats. You set the price and tailor make the gift to suit. Contact me to discuss your ideas via info@juliebladon.com. * Reedemable upto 12 months from the date of purchase. Non-transferable. The gift voucher will be posted to you. https://juliebladon.com/wp-content/uploads/2014/09/kerala_sunset.jpg 494 806 Julie Bladon https://juliebladon.com/wp-content/uploads/2016/08/logo_min-green-300x69.png Julie Bladon2014-09-25 14:08:312016-09-04 02:47:41Stuck for gift ideas? I’m back from deepest Oxfordshire where I had the pleasure of working for Wild Wellbeing in the Sanctuary area of Wilderness Festival. A perfect space for people to immerse themselves in peace and tranquility in order to feed their body, mind and soul. I love this Festival and it’s always a highlight of my annual calendar. There is a huge mix on offer and it’s certainly more than just music. Theatre, arts, talks, workshops, craft, wellbeing, lakeside spa, adventures, magical experiences, banqueting, good food, chilled vibe and great people. I was working as an in-house therapist offering Lomi Lomi massages in the Sanctuary. I love working outside, nature brings an added dimension to the treatments. The Sanctuary team was amazing, it’s great to work with such highly regarded therapists and yoga teachers in this special space. It’s not all work and no play though. Festival highlights for me included Burt Bacharach, Jessie Ware, London Grammar, dancing at the “Village Hall”, dancing to a soul band in the pouring rain, the fire spectacular, bathing in the light of the supermoon (the closest and largest full moon of the year) and accompaniment from the Friends of the Earth Busking Stage whilst we were massaging. Here’s Vogue’s “Postcards from Wilderness Festival”, a picture diary of the weekend including a special mention for the Sanctuary! Two weeks to Wilderness Festival! Thursday 7 – Sunday 10 August 2014, Cornbury Park, Oxfordshire. Not long now to go until my favourite Festival… Wilderness is the multi-award winning 4-day festival combining live music, contemporary arts and an array of theatre, craftsmanship and dining experiences. Headliners include London Grammar, Burt Bacharach and Metronomy. I will be an In-House Massage Therapist with Wild*Wellbeing at The Sanctuary, WILDERNESS Festival. The Sanctuary returns for another body-healing, soul-nourishing year, securely nestled on the top of a beautifully shaded hill above the lakes. Hugely popular – the Sanctuary has even more to offer in 2014. The Wild*Wellbeing team has curated The Sanctuary as a festival destination, combining leading yoga teachers to twist, stretch and shake down your body, alongside a repertoire of highly qualified therapists and complementary health and wellbeing consultants from all disciplines. From acupuncture to zero-balancing, there is no ail that can’t addressed in this village of happiness. Wilderness – The Film from Wilderness Festival on Vimeo. Visit the Wilderness Festival Store to book your treatments. Click here for more about Wilderness Festival. https://juliebladon.com/wp-content/uploads/2014/01/Sanctuary-Website-banner-930.png 342 930 Julie Bladon https://juliebladon.com/wp-content/uploads/2016/08/logo_min-green-300x69.png Julie Bladon2014-07-24 13:41:442016-09-04 02:48:00Two weeks to Wilderness Festival! As I prepare for the Aloha Yoga Summer Retreat, which takes place at the end of this month, I found this beautiful poem from one of last year’s guests. This poem took me right back to Bala Brook, a truly stunning location for a retreat. Reading this poem brings a huge smile to my face and an opening of my heart. Not long until our 2014 retreat, I can’t wait! The setting was perfect – Nature all in tune. the gardens were beautiful, that is no lie. My fellow yogis were a lovely gang. All individuals and happy to hang. we were completely ourselves with just yoga, peace and love no less. Jackie and Julie are teachers most kind. And Christine our cook made lunch with our foraging finds. but most importantly we laughed and at times even wept. As well as of the love and happiness that deep down we can hide. For it brings out the knowledge that doing nothing is BLISS. 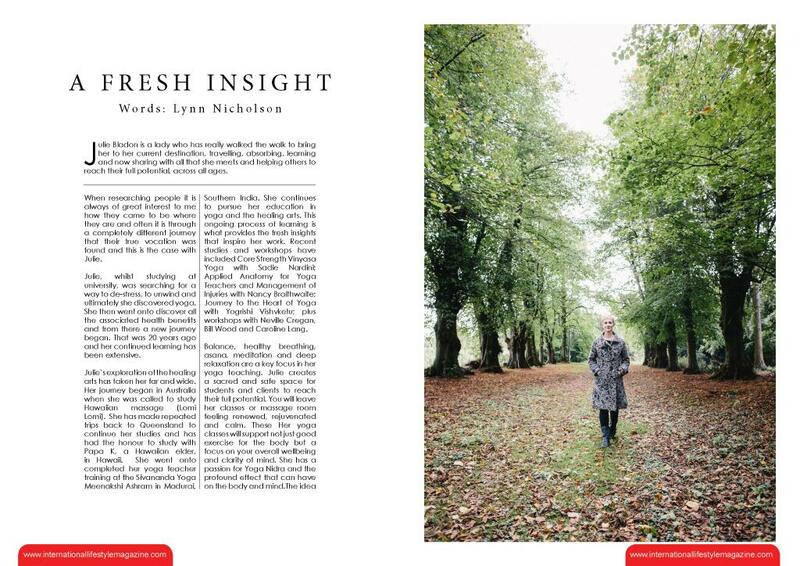 I am extremely honoured to have a feature in the new edition of the International Lifestyle Magazine. The International Lifestyle Magazine takes a look at positive lifestyle choices from around the globe. Promoting balance in life. It’s a really great magazine featuring retreats, alternative health and wellness, recipes, yoga, meditation, travel. Be inspired and take a look! Plus it’s totally FREE. You can sign up to get the magazine to your inbox each edition and International Lifestyle Magazine is on Facebook.